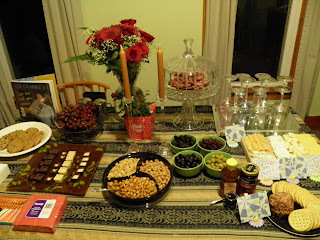 I hosted a wine and cheese party for some of my favorite people last Saturday. I've mentioned this idea before, but I finally put it together and did it and enjoyed every minute. 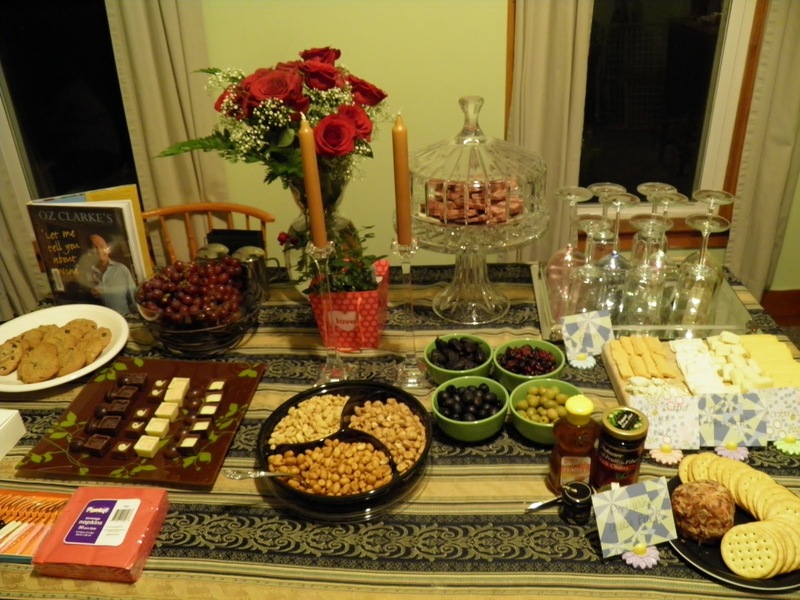 We had quite the spread of cheeses, a tub full of wine bottles, and a choice assortment of dried fruit, figs, olives, chocolates, crackers and nuts. My grandma recently bestowed me with my great-grandmother's china, and I couldn't have been any giddier to showcase it and put it to good use. 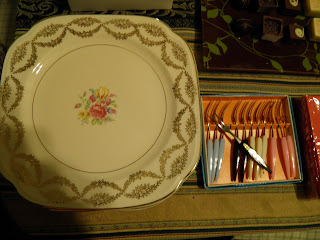 My great-grandma bought the set for herself while she worked outside the home for a short time. You see, my great-grandparents owned a farm and didn't have a lot of money left over after getting the necessities for frivolity. So, it just makes me feel all tingly knowing she did this one nice thing just for herself. We also broke out our Tiffany candle holders that have been protectively wrapped up in tissue inside the familiar blue box. These were a wedding gift from almost five years ago that I am always afraid to bring/leave out. We joke that they're some of the only refined things we own, aside from the china now. I put up a fun tinsel/streamer wall with a set of props and charades-like cards for picture-taking. With a little encouragement, almost everyone got their mugs captured. Even my husband tried his best Rockette's pose. Oh boy! We watched a comedy collection of four Independent Films and rated Best Picture, Best Performance, and Best Original Story. We chatted. We broke out the Wii. And a few of us went out to a lounge afterwards to catch a cover band, featuring a friend of one of the girls. I am truly honored and grateful to have such wonderful friends. Sometimes, winter seems to turn us into such impersonal, stagnant beings. We only see our neighbors if we both happen to be outside shovelling at the same time. Everyone's hibernating in their own homes, there's not a whole lot to do, and we can start to feel quite bored and lonely. This party sure broke up some of the winter doldrums and made my heart feel all warm. I think I might start a new tradition and try this again, once every year.